Focus assist (also called quiet hours in earlier version of Windows 10) allows you to avoid distracting notifications when you need to stay focused. 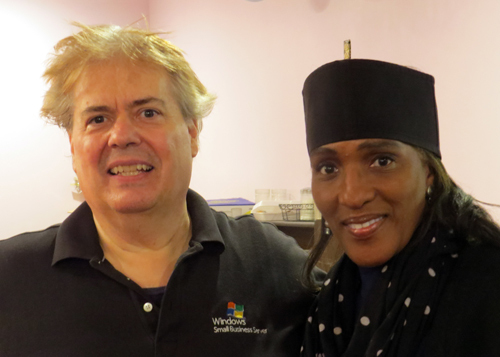 The Windows blog says "Most of us spend between 3-6 hours � each day � on screens. Much of this time is spent on social media, where the constant stream of distractions across our myriad of devices makes it hard to focus. 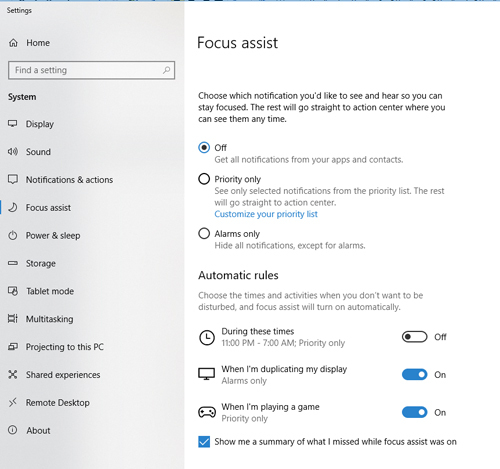 With the Windows 10 April 2018 Update, we�re introducing Focus Assist to help you stay in the zone. Focus Assist helps you get more done by easily blocking notifications, sounds, and alerts to create distraction-free work times. This is helpful if you�re giving a presentation or trying to focus on a paper, you can use Focus Assist to block interruptions or distractions. Work the way you want. Focus assist gives you the flexibility to choose when to block interruptions. Turn on Focus assist whenever you want to get things done without distractions, like notifications, sounds, and alerts. Or set Focus Assist to turn on automatically at certain times during the day. Stay connected when you need to. You can make sure your most important people breakthrough by creating a priority list of those you always want to reach you, even when you�re working. Or when you need complete concentration, block all notifications. Go to Settings - System and click on Focus Assist. You will see Priority and Alarm modes. 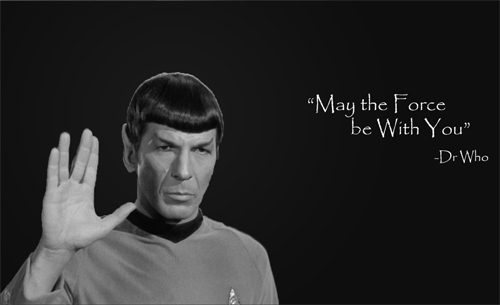 Did you ever wonder what the difference between a Geek, Nerd (and even Dork)? This funny tech video will explain. 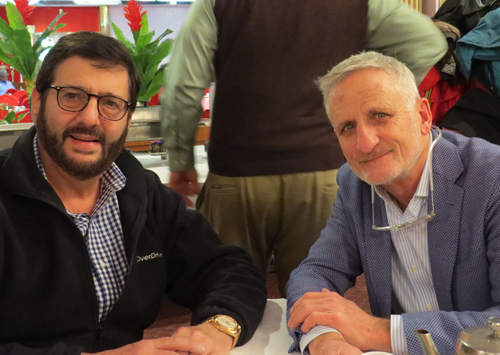 Each year we like to gather an eclectic group of friends and business associates for a holiday lunch. No, it's not just techies. Media, non-profits, politicians, business, cultural - they were all represented. 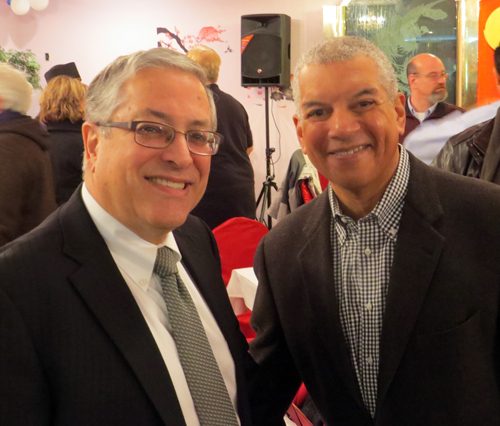 The food and atmosphere at Bo Loong at 38th and St. Clair is always terrific and our 75 guests maxed out the party room. In the Windows 10 April 2018 Update, (aka Redstone 4) Microsoft added some functionality to the popular task bar. If you click on the icon just to the right of the Cortana 'Type here top search' in the task bar you will get a screen of all your open windows and can navigate to them easily. Windows 10's new Timeline feature can track what documents and Web pages you've been working on over the past weeks and months, not just what is open now. Click on Windows Key and Tab	(or the icon) and you can start organizing by date and pick up where you left off work. This kind of feature is maybe my favorite in Office 365. I like being able to load a Word document, for example, and being asked something like 'Do you want to continue where you left off on (date).' 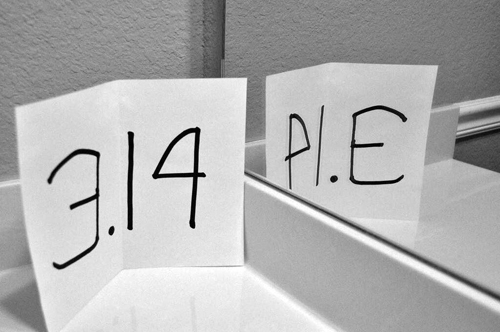 Very useful. 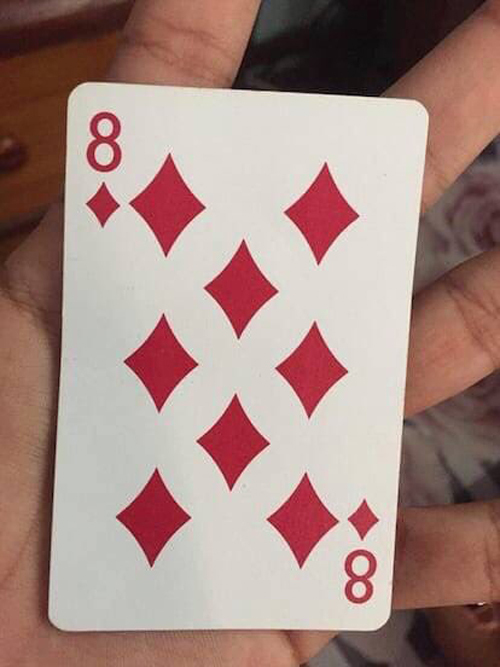 Did you ever notice the number "8" in the middle of the 8 in a deck of cards? Microsoft Teams is a platform that combines workplace chat, meetings, notes, and attachments. The service integrates with the company's Office 365 subscription office productivity suite, including Microsoft Office and Skype, and features extensions that can integrate with non-Microsoft products. Microsoft announced Teams at an event in New York, and launched the service worldwide on 14 March 2017. It erleased a free version to compete with Slack. Slack�s free version limits users to 10,000 searchable messages, though�and Teams does not. That�s one of the key selling points of the new free Teams service; the other is the number of users�300�which will be enough for many small businesses. Do girls understand the power of STEM to change the world? In partnership with Global Ties U.S. and the U.S. Department of State, the Cleveland Council on World Affairs (CCWA) welcomed local leaders in civil society, government, and business, along with leaders in international exchange programming throughout the country, to highlight the region's public diplomacy initiatives and specifically how women have played a key role as Citizen Diplomats. The Women in STEM panel focused on the role and social impact of Women in STEM. The moderator was Dr. Evalyn Gates, former CEO of the Cleveland Museum of Natural History and the panelists were Feowyn MacKinnon, Head of School of MC (squared) STEM High School and Dr. Marla Perez-Davis, Deputy Director, NASA Glenn Research Center. Dr. Gates asked the panelists if girls really understand the power of STEM and how it can change the world. How does a tech company last (and thrive) for 21 years? Be great at what you do and also love what you do. Aztek says "With being in business since 1997, we have experienced some of the biggest changes in the digital industry. This ever-changing landscape is what we love. In our free time, we read, practice, design, and develop... for fun. That's just the type of people we are. This passion allows us to always stay on top of the latest trends and keep your business ahead of the competition." 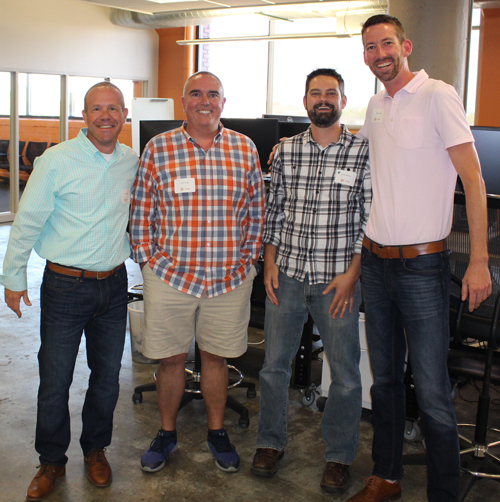 The Great Lakes Geek was honored to celebrate Aztek's 21st birthday at their new offices on Superior and East 36th. According to GlobalNewsWire, Computer History Museum (CHM), the world's leading institution exploring the history of computing and its impact on the human experience, today announced the public release and long-term preservation of the Eudora source code, one of the early successful email clients, as part of its Center for Software History�s Historical Source Code. The release comes after a five-year negotiation with Qualcomm. The first version of Eudora was created in the 1980s by Steve Dorner who was working at the University of Illinois at Urbana-Champaign. It took Dorner over a year to create the first version of Eudora, which had 50,000 lines of C code and ran only on the Apple Macintosh. In 1991, Qualcomm licensed Eudora from the University of Illinois and distributed it free of charge. Qualcomm later released Eudora as a consumer product in 1993, and it quickly gained popularity. Available both for the IBM PC and the Apple Macintosh, in its heyday Eudora had tens of millions of users. The discussion with Qualcomm for the release of the Eudora source code by the company�s museum took five years. Qualcomm has transferred ownership of the code, the Eudora trademarks, copyrights, and the Eudora domain names to the Computer History Museum. The transfer agreement allows CHM to publish the code under the very liberal BSD open source license, which means that anyone can use it for either personal or commercial purposes. 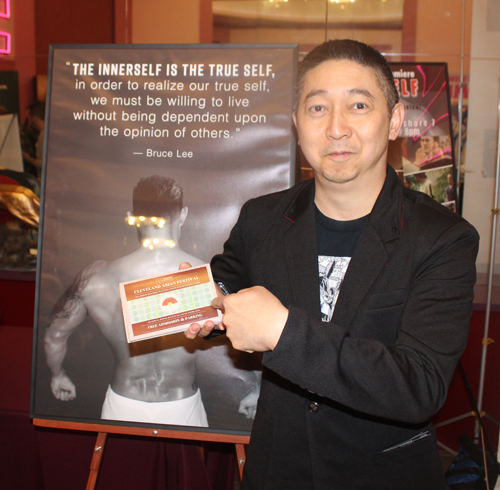 INNERSELF, the latest production from director Johnny Wu, is a martial arts musical coming of age story about a young man who was bullied when he was young and is now himself a bully. After realizing what he has become, he struggles to become a better man. The film's Kung fu, choreography and vibrato coupled with the discipline to discover our inner self reveals the hidden master in all of us. The cast and crew were on hand for a special screening of this fun feature film in the large 400-seat theatre at the Atlas Cinemas Lakeshore 7. It's been a long time since the Great Lakes Geek studied topology and he wasn't around when they used this book. 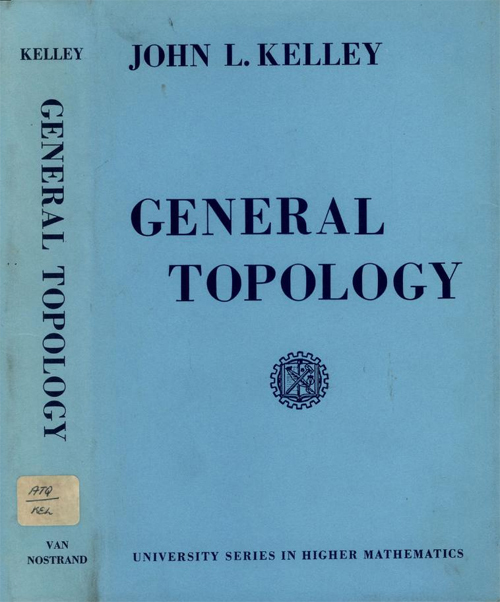 But it's great to see John Kelley's classic graduate level textbook from the 1950s-70s in general topology available online in a variety of formats for free. A great resource for Windows previous versions documentation. Has content for older products or services, such as release notes, deployment guides, and how-to articles. If you're looking for specific information (like Windows 8.1 release notes or how to repair a Windows image), you can use the Search box to search all of the older Windows client libraries. Beverly: Is that a rhetorical point, or would you like to do the math? Sheldon Cooper: I'd like to do the math. Beverly: I'd like that, too. Here we go. Say there are 44 possible numbers and you have to pick the lucky 6 to win. How many ways are there of choosing a 6-number combo from the 44? The formula is C (44,6) which is 44 factorial divided by (6 factorial x 38 factorial) or 44! / (6! *38!). Then the probability of coming up with a specific 6 number combination is 1 over that number. Refresher: Factorial is the product of that number and all the positive integers less than it. 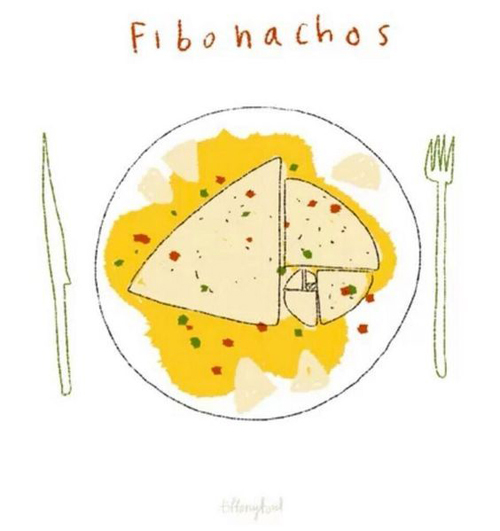 So, 6 factorial, designated as 6! is the product of 6x5x4x3x2x1 or 720. Factorial get huge fast. For example, 10! is 3,628,800. So 44! is huge and 1/44! is minute. To see the chances for a particular lucky number being in the selected 6, you want to find the probability that the winning 6 number combination will contain any given number. First, you want to figure out how to not pick that number. You have to choose the 6 numbers from the other 43 so use the formula C(43, 6). There are C(44,6) - C(43,6) combinations which include your lucky number. 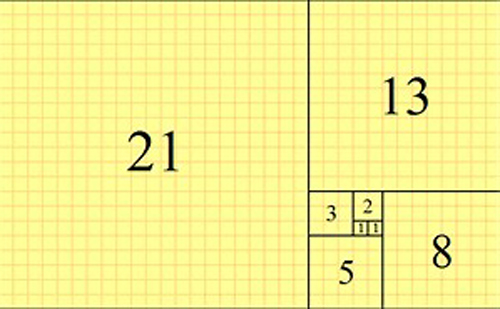 The probability is then that result divided by C(44,6). Moral? Don't quit your job to win the lottery. Computer techies (OK, geeks) Bob Coppedge and Dan Hanson used to take groups to various places of interest to computer professionals (OK, other geeks). They called it Bob and Dan's Excellent Adventures. This video from 2004 was just unearthed from some old DVDs. This was a different adventure as Bob and Dan visited a cemetery and visited the graves of some old technology - from dBase to Win 95 before facing their own demise. 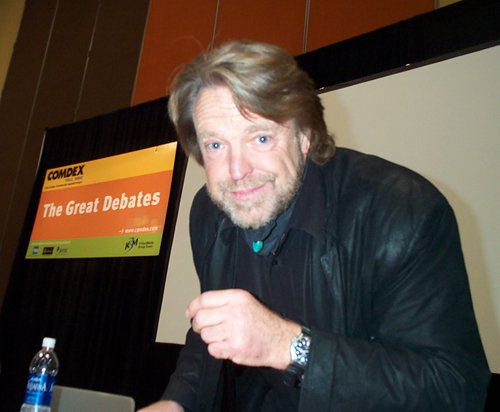 John Perry Barlow was a founder of the Electronic Frontier Foundation and a strong believer in cyber liberties, He co-founded the EFF in 1990 with John Gilmore and Mitch Kapor to promote Internet civil liberties and to champion free expression and privacy online. Barlow was also a lyricist for the Grateful Dead and co-wrote songs with the Dead's Bob Weir such as Mexicali Blues and Cassidy. 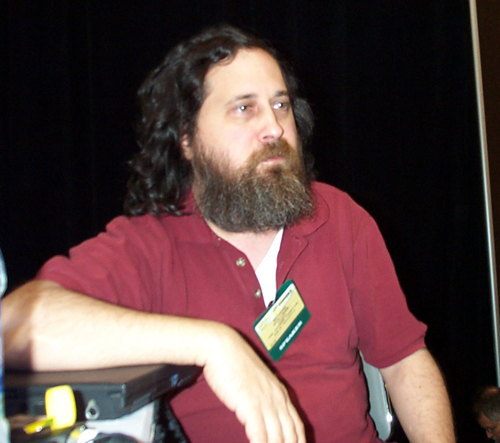 I got to meet Barlow at Comdex in Las Vegas in 2002 when he was a panelist debating Internet civil liberties. 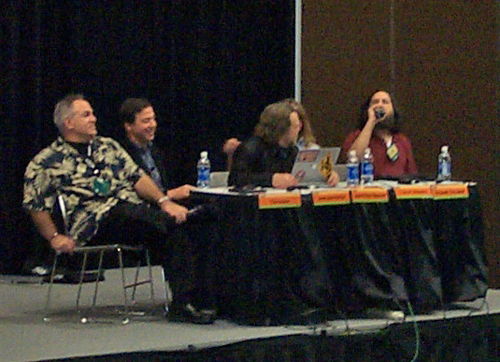 Also on the panel was Richard Stallman who launched the GNU Project, founded the Free Software Foundation, developed the GNU Compiler Collection and GNU Emacs, and wrote the GNU General Public License. I had heard that Stallman in particular was not easy to get along with but both men were very gracious in sharing their time after the debate in discussing issues with a geek from Cleveland. The Great Lakes Geek often gets questions about gambling and the lottery. Just the other day I was asked to figure the odds of a tossed coin landing on 'heads' after 9 'heads' were tossed in a row. I explained and the person still does not believe the answer. I told him that if a fair coin is tossed and heads comes up 9 times in a row it has no effect on the next toss. A coin has no memory so there is still the usual 50-50 chance of tails or heads. The previous 9 or 900 tosses have nothing to do with that next toss. The confusion is about the probability of tossing 10 'heads' in a row. That's a whole 'nother smoke. The probability of one head in a row is 1 out of 2 (.5), the probability of 2 heads in a row is 1 out of 4 (.5 x .5), 3 heads is 1 out of 8 (.5 x .5 x .5) and so on. So the probability of 10 heads in a row is 1 out of 1024 (.5 to the 10th power) or .0009765625. In a real world case where someone tosses 9 heads in a row I would be concerned about the fairness of the coin. 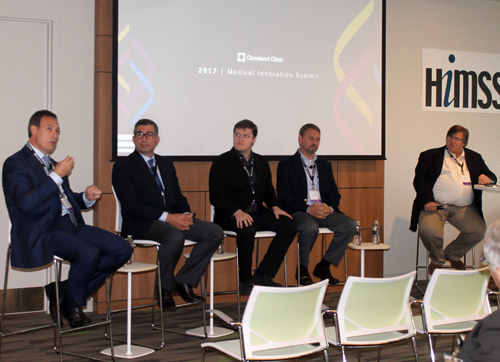 One Impact Session that caught the eye of the Great Lakes Geek was titled 'Made-to-Order Surgery: How 3D Printing is Revolutionizing the Operating Room.' featuring Moderator David Cassak, Managing Partner, Innovation in Medtech LLC and panelists Jihad Kaouk, MD, Institute Vice Chair for Surgical Innovations and Director, Center for Laparoscopic & Robotic Surgery, Glickman Urological & Kidney Institute, Cleveland Clinic, Karl West, Director, Medical Device Solutions, Cleveland Clinic, Jacques Zaneveld, PhD, CEO, Lazarus 3D Printing and Nizar Zein, MD, Chair, Global Patient Services, Cleveland Clinic. Great tweet from Vincent Pantaloni: If you're a topologist (Helvetica font style) there are 8 (capital) letters in the English alphabet. 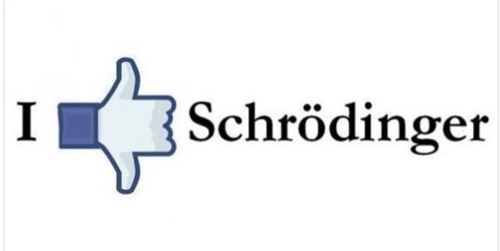 So how do you feel about Schrodinger? If you have a screen full or windows, you can clear the clutter by grabbing the top of the window you do like and "shaking" it to minimize all the other windows. Shake again and the windows will come back. 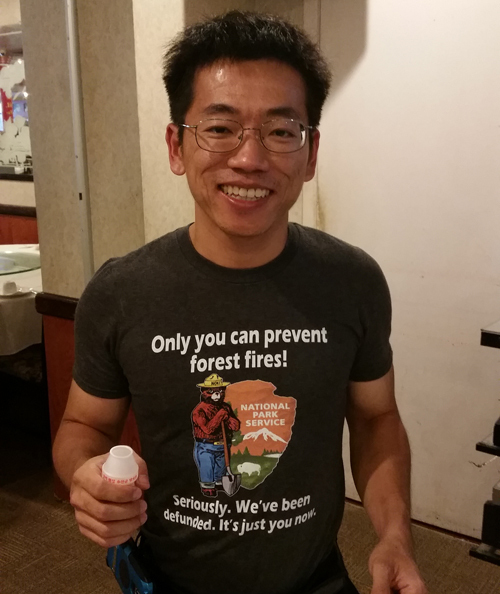 Self-proclaimed Geek David Huang rocks this t-shirt which says "Only You can prevent Forest Fires. Seriously. We've been defunded. It's only you now.". 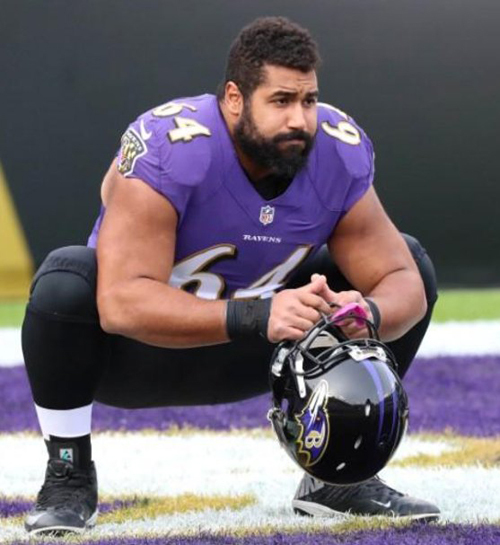 NFL player John Urschel, seeking Ph.D. in math, retires from football at 26. There can only be one explanation. To get babes. Maryam Mirzakhani was an Iranian mathematician and a professor of mathematics at Stanford University. Her research topics include Teichm�ller theory, hyperbolic geometry, ergodic theory, and symplectic geometry. 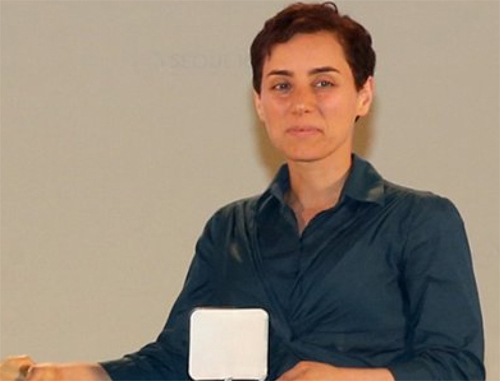 In 2014, Mirzakhani became both the first woman and the first Iranian honored with the Fields Medal, the most prestigious award in mathematics. The award committee cited her work in "the dynamics and geometry of Riemann surfaces and their moduli spaces". Association of Indian Physicians of Northern Ohio (AIPNO) was founded in 1983 as a non-profit organization of physicians of Indian origin in Northern Ohio. A 'Yatra' is a holy pilgrimage. 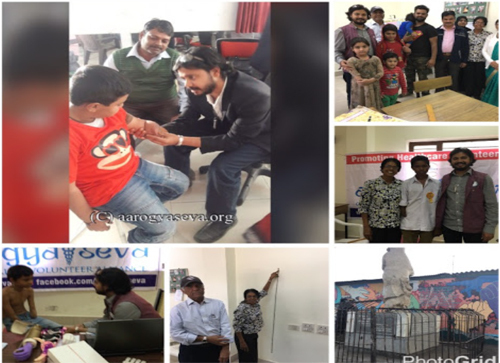 For years, Dr Jaya Shah and Ramesh Shah have led an AIPNO Medical Yatra to tend to the needs of the poorest in different areas of India. Many of the people that the team of doctors see and treat have never had any contact with a medical professional. 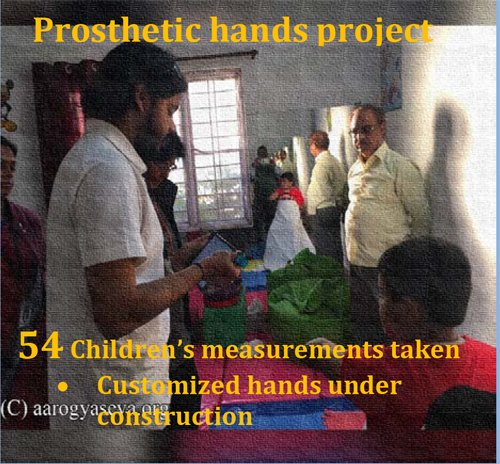 54 Children (amputees) will be given �Gift of Hands� -courtesy of a 3D Printer generating prosthetics for life changing transformations. By popular demand (really, would we lie to you?) 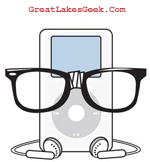 the Great Lakes Geek is bringing back the free Geek eNews. It will be sent via e-mail whenever we have something really good to share. Not too often, we promise. So sign up and look for the news, tips, puzzles, contests, special offers and other information that only the Great Lakes Geek can bring you. The Michelson�Morley Experiment was conducted in 1887 by physicist Albert A. Michelson of Case School of Applied Science and chemist Edward W. Morley of Western Reserve University. This experiment proved the non-existence of the luminiferous ether and was later cited as circumstantial evidence in support of special relativity as proposed by Albert Einstein in 1905. 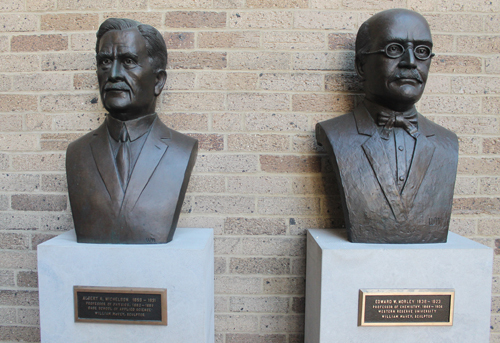 Michelson was professor of physics at the Case School of Applied Science, and Morley was professor of chemistry at Western Reserve University (WRU), which shared a campus with the Case School on the eastern edge of Cleveland. The Michelson-Morley Experiment was performed in several periods of concentrated observations between April and July 1887, in the basement of Adelbert Dormitory of WRU (later renamed Pierce Hall, demolished in 1962). Michelson became the first American to win a Nobel Prize in science. Now available for the first time as an e-book! 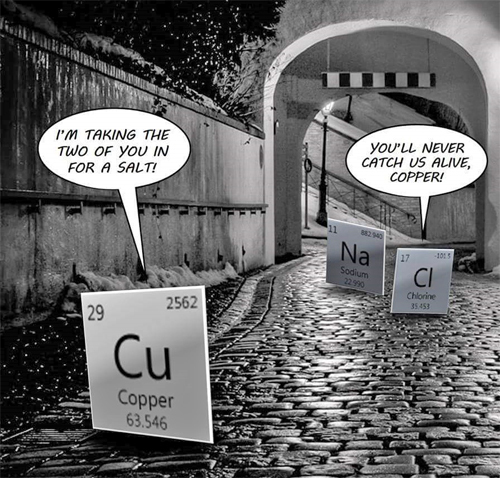 The cartoons in this e-book have been specially formatted for optimal viewing. 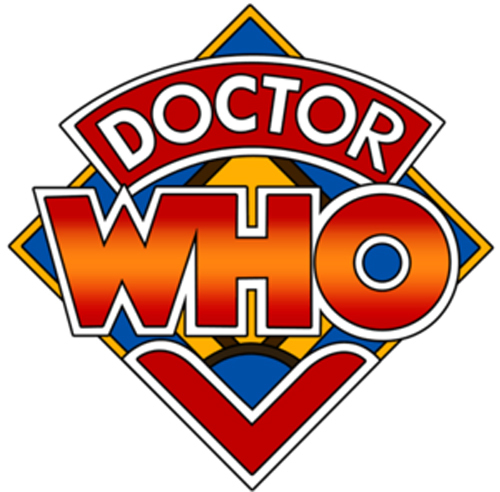 The e-book will only work on color tablets and is not intended for viewing on desktop apps or black and white tablets. Bill Watterson's Calvin and Hobbes has been a worldwide favorite since its introduction in 1985. The strip follows the richly imaginative adventures of Calvin and his trusty tiger, Hobbes. Whether a poignant look at serious family issues or a round of time-travel (with the aid of a well-labeled cardboard box), Calvin and Hobbes will astound and delight you. The Great Lakes Geek thinks that programmers of his generation (harrumph!) are better because they didn't have all the visual tools. In fact the best learning experience, in his not so humble opinion, is writing directly to the processor, without an operating system. A great learning tool is writing you own OS in assembler. There is a free online course from the Cambridge Computer Laboratory that teaches you how to write your own operating system using assembly code. Q: Why did the Higgs Boson go to church? Did you hear about the company that sells elastomeric insulators? Their motto is "Resistance is butyl". Intern: How I get to the marketing department? Engineer: Easy, go west until you can smell it and then turn north until you step in it. We had our engineers work in HR for a week to encourage better teamwork. They immediately sent out an employment ad that read "Supermodels wanted, (must be able to solder.)" Congratulations to the winners of some terrific new Cleveland focused books. Winners have been notified and books were taken to the post office for delivery. Do you understand them all? We are proud to be Kroll Ontrack� Data Recovery Certified Partners. This allows us to offer clients the best-of-breed products and services that Kroll Ontrack provides to recover your lost data. NOTE: Tampering with media information may result in irreversible damage. Contact us right away when you have data loss to maximize the chances to recover your data. Desktops, Servers and Notebooks - Oh My! Need new hardware? Why pay extra for those expensive name brands? Check out our on-line hardware store and browse pre-configured systems or tweak the configuration options yourself and get instant pricing.